Gorgeous Interiors and so close to the beach! Reserve your 2019 Summer Vacation at 3 Sailboat Lane Today! Property Size 2,071 sq. ft.
Gorgeous Interiors and Ocean View in new upscale oceanfront community! Only 150 private yards to gorgeous beach. Reserve your 2019 Summer Vacation at 3 Sailboat Lane Today! Enjoy the ocean view from this custom designed home in a new, luxury, oceanfront gated development. 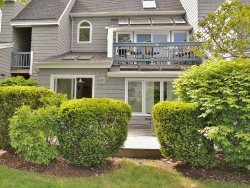 With deeded beach rights & oceanfront common space, this vacation home will have you and your family coming back year after year. Unwind in the casual luxury of this gorgeous vacation home that features generous living space inside and out. This ocean view beach house is as close to oceanfront as you can get with 320 feet of oceanfront common space and new paved walkways. Master Bedroom: Queen, #2: Queen, #3: Queen, #4: Two Twins; Finished Basement: 2 Queen Beds, one twin.